At the weekends especially during the summertime, when the weather is warm, it is usually a fantastic time to treat your family and friends with good food. A gas grill is a piece of fantastic equipment that you can have at the backyard to prepare good food like a weekend barbecue. In case you previously had an old grill that doesn’t function, it is time to replace it with a new model that is better; after enjoying many years of service. But, if you want a new grill to find an efficient gas grill with a reasonable price that can give you many years of service. Choosing a suitable grill can be at times overwhelming due to the price point and different grill features. That’s why we have sorted out and provided you with a list of the best gas grills under 500 dollars that are present in the market. Owing to interesting features, the Weber Spirit E310 overall takes the trophy of the best gas grill around. Why is it so? This grill has the best grilling area, suitable size, quality elements and efficiency that is in proportion to its price. Weber Spirit II E-310 is an upgrade of the E-300 with additional features but at a premium price. It can adequately cater for a family dinner as it generates 30,000 BTUs with a 529-square inch cooking space. At the main area, you will find easy-to-clean porcelain enameled iron-cast that will help avoid food from sticking. To turn on the grill, you will just use a simple electronic ignition button, and in case, the propane amount runs out during the cooking process, you can just check the fuel gauge. The Porcelain-enameled Flavorizer bars are usually a preserve of the most expensive gas grills. This system generates smoke when cooking, and juices from the food usually sizzle from it. An aluminum mold construction prevents the equipment from rusting and increases the grill’s durability. A cooking area of about 529-square inch. 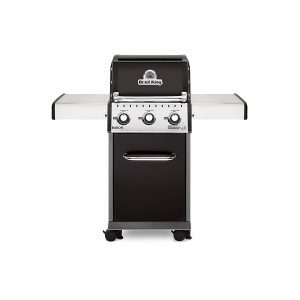 For customers that have a small space, there is a small version of the Broil King’s Baron line known as the Baron 320-S. 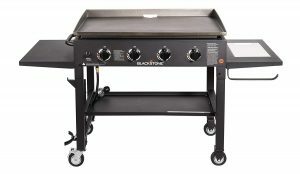 This grill is small and well-built grill with fold-down side tables; meaning it will take less space and grill less food. The construction and features that appear on any Broil King model are usually superior. There the stainless steel burners on the two side tables that allow gas to flow front and back evenly. This is a distinguishing feature from other many gas grills. 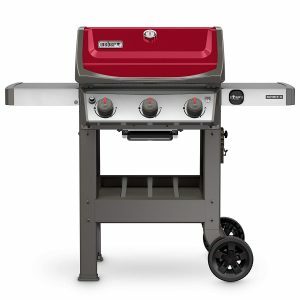 While other grills have uneven heating, the dual-tube burners found on this model sought out that problem to deliver even heat. If you need a tasty dinner in record time, Baron 320 3-Burner Gas Grill is the equipment to acquire. Burning food or undercooking is avoided as there are knobs to adjust the heat amount. While there are people who applaud it for its above-average features and great temperature control, most individuals love it due to its low price point. It is undoubtedly a perfect grill in cases where the cooking caters for a few individuals. Some people desire to have full-sized grilling but have inadequate room or do not want to accommodate a traditional full-sized gas grill. For this reason, the small space grills began to emerge. Dyna-Glo 2-burner version model is one such grill capable of handling about 17 burgers at one moment. Several tests even reveal that The Dyna-Glo Smart Space Living is better in performance and much more affordable compared to the expensive Dyna-Glo 5-Burner. In comparison to its sides, the center and back part of the grill is usually hotter, which may make cooking a bit uneven. 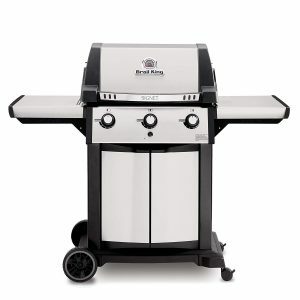 It has a small main grilling space than other top-rated gas grills. The side tables found on this compact gas grill easily fold down for storage making it a nice option for decks that have tight and limited space. This grill is additionally easy to maneuver and lightweight since you can lock into place using two swivel casters when in use and then, unlock it whenever you want to store it. While its burner consists of a five-year warranty, its other parts have a warranty of only one year. An Easy push button in-built in an electronic pulse ignition system. Heavy gauge porcelain enameled cast iron cooking grates. Char-Broil recently came up with a massive Performance grill that entails 5 burners imputed on the grill. So, when it comes to the number of burners, this grill is above the others. People who feel their budget is too tight have a reason to celebrate as this is a lower price point grill that grills without compromising on quality. The grill can deliver a 45,000 BTU heat and an additional 10,000 BTU from lidded side burner for various cooking options. Whenever the burner is not in use, you can save some extra workspace as the lid easily folds down. The cooking grates areas measures a combined 755 square inches; where the cooking space is 550 square inches, and the warming space on the swing-away rack is around 205 square inches. Its grates are made of cast iron material that is coated with porcelain. You can even cook a large larger game, such as a full sized bird, with this large grill through swing it on the warming rack. 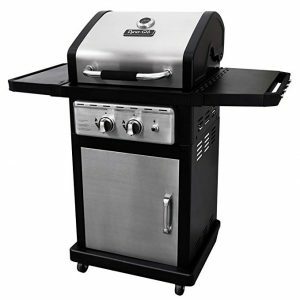 The grill’s stainless steel lid is fashionable and durable while its cabinet and handle are great looking. Any beverage and cooking tools can be put on the large double cabinet space. Four casters will aid move this massive grill and lock it where you wish to position it. Monitoring the interior temperature without lifting the lid is possible as you will use the thermometer mounted in the lid. Every time you need to start the grid, you can utilize the electronic ignition. There is also a removable grease pan that is easy to clean once you are done cooking. The Broil King Signet gas grill is a powerful and good sized gas grill. 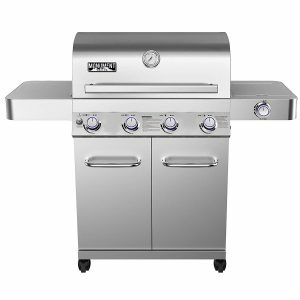 This grill is one of the 3-burner gas grills with great construction that you can find for less than $500 in the market. If you need to grill without limitation on smaller patios and yards, this is the right mid-sized grill to consider. Signet is a good choice for certain cooking options due to some notable features. 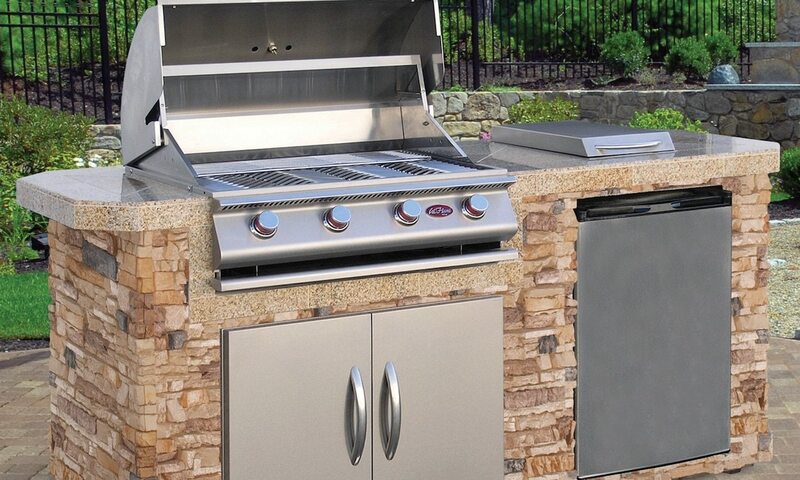 The grill has a superior burner design that is revolutionary and unique to offer even heating. Its burners permit the front to backflow of gas while the inner tube distributes the gas evenly to the outer tube. There are heavy cast iron cooking grates that provide exceptional heat transfer and a firebox design that retains in heat allowing you to sear easily and employ versatile cooking skills. The grill provides 40,000 BTUs that is effective for cooking and occupies a cooking area of 400 square inch that is capable of managing a few guests. Stainless steel and cast aluminum are the material used to build the grill’s body. The side tables are foldable, minimizing on space when not usable. It is, therefore, a fantastic value grill for outdoor cooking where there is no enough space to accommodate an extra-large sized grill. 10-year limited burner warranty and Limited lifetime grill warranty. Blackstone grill is a more than a grill as it is a griddle. It is a home grill that rivals other commercial griddles due to its excellent cooking system, 4-burner setting, propane-fueled ignition, and expansive grilling space. Apart from making your food delicious, the grill gives it a classic look. The operation of this kind of grill is similar to the traditional best gas grills under 500 dollars as it has a flat top that enables food to be prepared without burning. Due to its flat cooking surface, food falling through the grates that can dangerously cause flare up flames is prevented. The cooking space that it provides, 720 square inches, is adequate to prepare family parties or dinners. An electronic ignition button makes it easy to operate this grill. For storing of cooking tools, there are two side shelves and a bottom shelf that offers extra space. After using the grill, comfortably roll it on its wheels to store.The griddle top is usually removable while the leg folds up to tuck it away. Apart from cooking bacon, you can prepare fluffy pancakes or meat on it as the grill top is usually evenly hot. Its grill top gets evenly hot and cooks every dish perfectly either it is an egg or meat. Using this marinated griddle, you can also provide grilled cheese sandwiches, sausages, hamburgers, and steaks. Apart from being a normal grill, it has a rotisserie. With this feature, you can evenly cook the best chicken and roast as they spin on the spit. The grill has four main burners that produce a total of 60,000 BTUs per hour and an additional side burner. A cooking space of about 500 square inches and a warming space of around 200 square inches is available on the best gas grills under 500. As you continue with the cooking process, you will be able to keep the food at the serving temperature on a warming rack. The rack is made from cast iron and coated with porcelain to prevent food from sticking on the grates and enable heat to distribute evenly. Stainless steel is visible on the exterior part of the grill that is rust-prove and easy to maintain. Checking the temperature is made easy with the in-built thermometer. In case you want to control the temperature, you can use the insulated frame and the front panel knob controls. Even at night, you will not need a flashlight to control temperature as there is a blue LED light backlight at the control knobs. 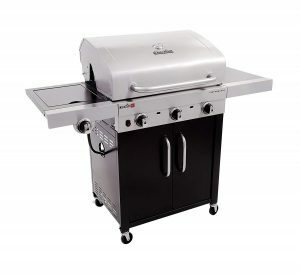 Four heavy-duty casters are under the grill that allows you to move and lock the equipment at the desired cooking spot. Great side dishes and sauces can be prepared using the side burners that are found on either side of the grill. After the party is over, you can easily hold used sauces and utensils in the stainless steel shelves for later cleaning. There is extra storage that is roomier and wider than other similar models. All-in-all, the outstanding feature of this kind of a grill is the rotisserie kit that allows you to cook a full-sized bird easily. Quality of the internal components, burners, and firebox is limited. One of the crucial aspect to consider when choosing the best gas grills under 500 dollars is the cooking area. The area which is measured in square inches shows the amount of space allocated for cooking. So, ensure you select a grill with an adequate cooking area that caters for your BBQ and home party needs. The size of a grill usually ranges from large to portable and compact. There is also a direct correlation between the size and cooking surface area. BTU usually shows the gas output and amount of heat that a particular unit generates towards the cooking process. It is crucial as it enables you to estimate the amount of time you will spend grilling. BTU is related to gas consumption, which should be checked from time to time to maintain the budget. After reading the above information, you now have extensive knowledge about the best gas grills under 500 dollars. 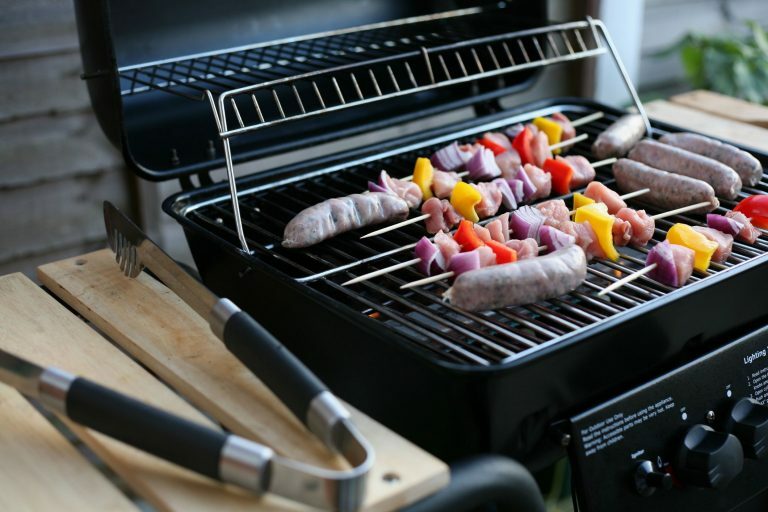 Gas grills carry many benefits that enhance the grilling experience. With a budget of $500, you can comfortably choose a grill that can cook an entirely seared, mouth-watering steak that you and your guests can enjoy. © 2018 Dailys Sports Grill. All Rights Reserved.